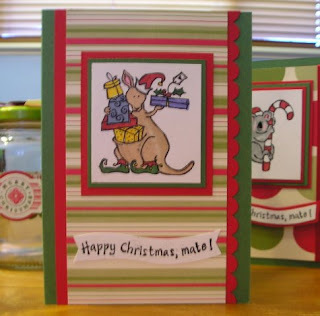 I just love the cute characters in the Happy Christmas Mate stamp set. The Kangaroo is just adorable (and the surfin' Santa is pretty cool too). Believe it or not I don't own this set yet so I stamped and heat embossed some images when I was at a friend's (Hi Vicki) ready to colour and use later. 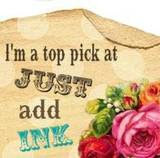 I have coloured the images with my Stampin' Write Markers. They have then been mounted on cardstock and I have used some papers from the Dashing Designer Series Paper Set. Of course my new scallop edge punch had to be used on the card as well. I have used that punch on nearly every card since I it arrived. 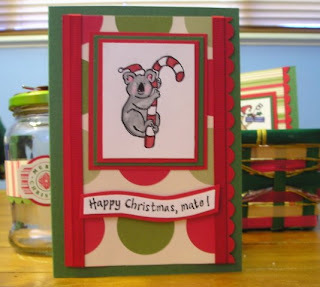 I love love love it and it is much quicker than using my corner rounder for scalloped edges. I really need to learn how to put my photos in the text as well rather that just at the top of my post. I am very computer challenged so please bear with me while I work out how all this blogging stuff works lol.